Upon my initial opening Trajan, the first thing I noticed was the components. More importantly, that there were a lot of them. Cards, round tokens, square tokens, house-shaped tokens, you name it. So, naturally, I expected a rather long, complex, and brain-burning game. What I got was indeed complex, and it definitely tickled my brain, but it was surprisingly easy to understand, and the rounds seemed to fly by. I knew Trajan was going to be good, but I wasn’t prepared for how good. There’s no denying that Trajan has some serious meat to it, but it’s also worth mentioning—and reiterating—that the meaty substances, while exquisite, are easy to digest. All the actions are broken up into sections, visible on the main board. 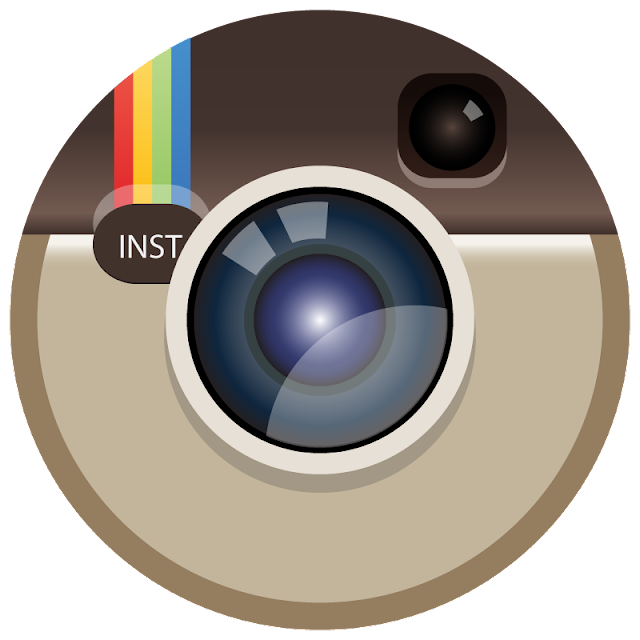 The iconography is clear, which certainly helps. After taking each action a few times, it’ll be much easier to remember what they all do, where they take place, and how they’ll affect your end-game score. Another great thing about Trajan is the various mechanics woven into it. There’s area movement, card drafting (kind of sort of), hand management, and set collection. Let’s not forget about the nifty time-tracker which determines the pace of the game depending on how you take an action (i.e. the amount of tokens used in your player rondel to activate the selected action). 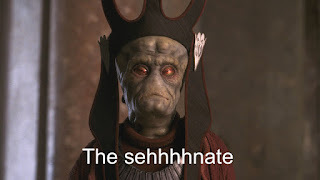 There’s some political maneuvering as well, as players vie for control of the senate through the Senate action, as well as by collecting tokens that increase your votes. Oh, and at the end of each round, if you can’t pay the demands of the people, you lose points, which may hurt—or may be but a small mosquito bite in the grand scheme of things. The way you play will determine how detrimental this will be. All these mechanics (and more) are tied in with such wonderful thought and balance that Trajan can sometimes feel like multiple games in one. And that, I think, is the inherent beauty of Trajan. There are so many routes to take on your road to victory, that there’s no “one way” to fame and glory. As mentioned, there are a lot of components in Trajan, but don’t let that put you off. I found the rule book to be quite clear when learning the game, and it didn’t take long to grasp the nuances of each action. That said, it took me longer than I’d care to admit to figure out how to make them all work together for my benefit. That facet of the game—the mixing of actions to form one über healthy point salad—brings me so much joy I’m actually embarrassed to talk about it. There is always something to do, even when you’d rather be doing something else but can’t. And that’s the other thing: managing your actions is so, so, so important. 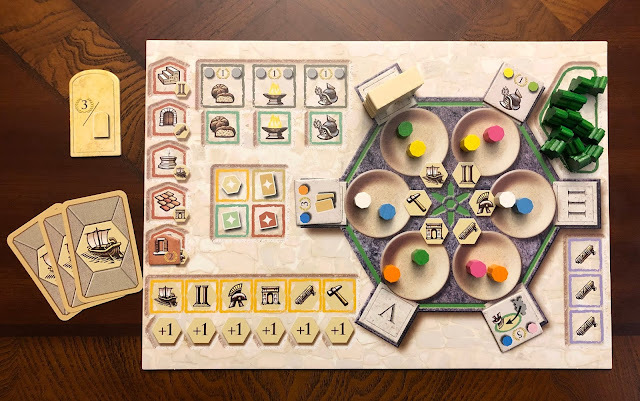 I’ll talk a bit more about this in the Gameplay section, but actions are determined by the tokens in the trays on the rondel on your player board. Simply choose a tray, pick up all the wooden tokens found therein, and drop them one at a time—clockwise—until there are no more left in your hand. Yes, it’s just like Mancala in that aspect. The difference is that the last tray to receive a wooden bit determines which action you’ll be taking (each tray is assigned one action). Managing your actions is crucial to success, which means you’ll need to plan out your actions a number of turns in advance (or pray for good luck). Not paying attention to where those wooden bits are falling can create an overabundance of them in one tray, and hardly any in others. As the game progressed, I found myself becoming more and more adept at planning out where to drop the tokens in order to have the proper amount for a specific action I was gunning for. This action-selection mechanic is beautifully done, and it makes you work for that winning strategy of yours (which may be completely different than the winning strategies of your opponents). For me, the games fly by. It still took the allotted time as shown on the box (30 minutes per player), but it just felt fast. That, folks, is how you know a game has been streamlined to perfection. 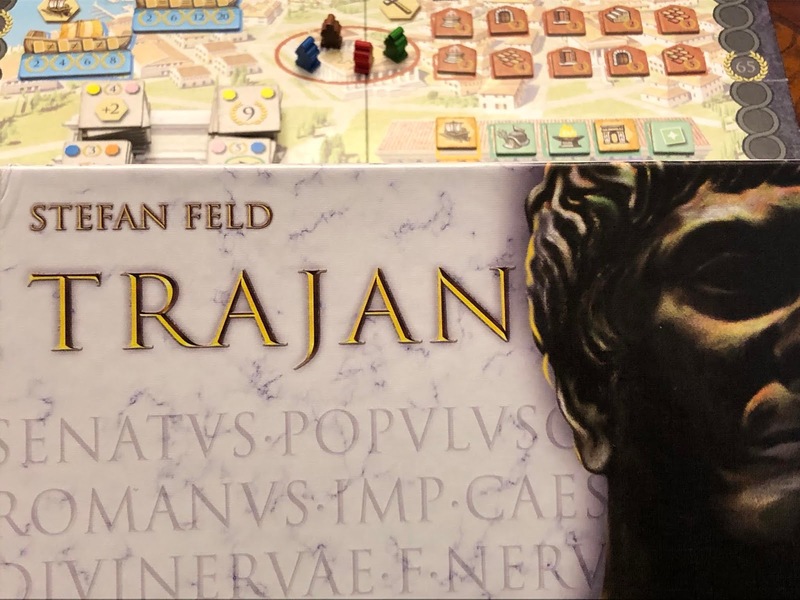 Many gamers are also more than familiar with the name Stefan Feld, including such hits of his as Castles of Burgundy and The Oracle of Delphi, so it will come as no surprise that Trajan is a solid game. In fact, I daresay that Trajan beats out Feld’s other games as the cream of the crop (yes, including Castles of Burgundy). But that’s just my opinion. Perhaps you’ll be in the same boat as me after playing Trajan. Whatever the verdict, there’s no doubt that Trajan—like the Roman empire—will go down in history as one of the greats. Game board setup (4 players). Give yourself some time to set this one up your first time, as there are a lot of pieces. Once you’ve set it up enough times that you no longer have to refer to the rule book, setup time will drop drastically. Check out the rule book for the minutiae of setup. For review purposes, let it be known that there’s a lot. But, it’s all explained in the rule book nicely, and it won’t take nearly as long the more times you do it (so maybe set it up in advance before your game group’s first play). The board is absolutely filled with cardboard tiles of varying shapes, sizes, and purposes. It may look like a lot at first glance (alright, so maybe it is a lot), but I didn’t find everything confusing as I expected. The first few rounds were enough to get me familiar with what each type of tile did, so that the problem wasn’t remembering what I could do, but rather figuring out what I should do. Considering all the pieces, Trajan moves pretty quickly. My first game took about an hour and a half, and that was with four players. And yet, each “year” in the game seemed to fly by. There’s just so much to do, and the rondel mechanic for action selection lets players dictate how fast they want the game to go (assuming you’ve planned out your turns well enough in advance). Let’s talk about the action selection mechanic for a moment. On your player board, there’s a rondel, made up of what looks like six scales. Each scale starts with two wooden bits (officially known as “action markers”). To take an action, pick up all the wooden bits from any scale. Then, one by one, drop them into the other scale spaces in a clockwise fashion, Mancala-style. The scale in which your last wooden bit is dropped is the action you will be performing this turn. The time/year marker moves forward one space for each little bit picked and placed from the rondel. That means if you choose to select a scale/space with two wooden bits on it and drop them clockwise in Mancala-style, the time marker will move two spaces. If you’re like me and failed miserably at planning out your future moves, you’ll be stuck with a heap of tokens to relocate along your rondel, thus moving the time token a heap of spaces. This may be good or bad, depending on how you want your game to go. Seaport Action - In which you may draw cards, or trade cards for points. 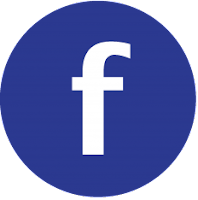 Forum Action - In which you select and take one forum tile from the forum location. Military Action - In which your forces go up north and conquer lands for points. Also another way of getting forum tiles. 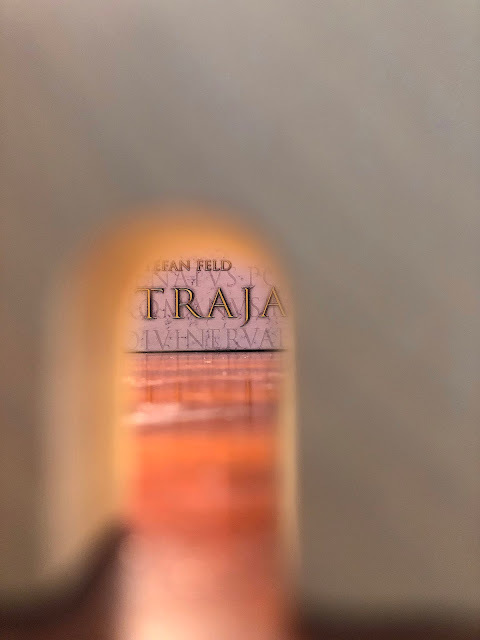 Trajan Action - In which you simply take the top Trajan tile from one of the six stacks at the Trajan location and place it on the space on your player board on which the Arch resides. Senate Action - In which you move your senate marker one space up the senate track, gaining any points associated with that space. If there’s already another marker on that spot, put yours on top of it, thus giving you priority in case of a tie. 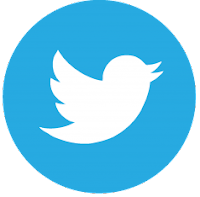 Construction Action - In which you may recruit a worker from your supply of workers (i.e. from your player board), or place a worker already recruited onto a spot in the construction location, collecting the title associated with that space and placing it in its proper spot on your player board. If this is the first time gaining a specific type of tile, take the free action associated with that tile (as shown on your player board). Your initial worker may be placed on any tile in the construction location; however, any subsequent workers must be placed adjacent to other workers (of your color) already at that location. Example of workers in the construction area. And there you have it. Each player takes their turn and moves the time tracker. Once the time marker passes the arrow on the time track, the current round ends immediately, and one of the three face-down demand tiles are flipped over, letting everyone know what the citizens are going to demand once all four rounds are over. After the fourth round, the year ends, and end-of-year scoring takes place (again, see the rule book for how this works). I will mention, however, that if you have not met all the demands of your citizens, you lose points: -4 for meeting two of the three demands, -9 for meeting one of the three demands, and -15 points for not meeting any demands (some ruler you are…). While this can be a game changer, players have won without giving their attention to meeting these demands, thus losing points at the end of each year. There are so many ways to earn points that one specific strategy won’t be the only strategy. 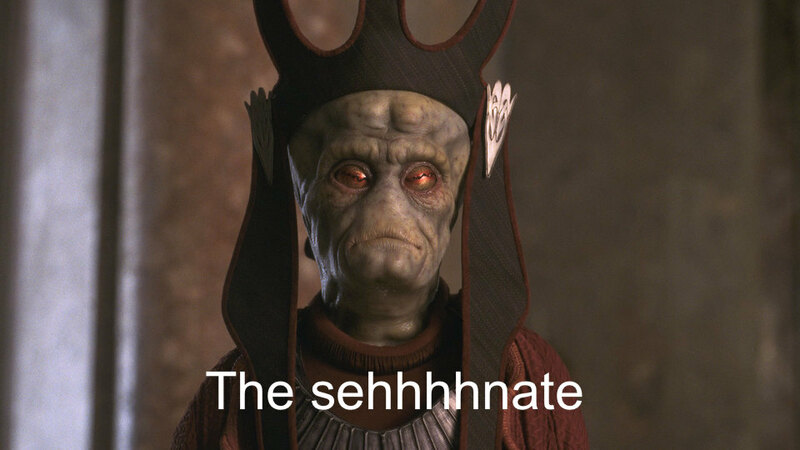 Maybe the senate (or “the sehhhhnate”, as spoken by Nute Gunray, Nemoidian and Minister of Trade during the trade disputes leading to the rise of the Galactic Empire) will be your route to victory. After all, those highest up on the sehhhhnate track gain bonus tiles that can score them even more points. Or, maybe you’re going to focus on conquering your way to victory by placing soldiers in the northern regions and gleaning their points (and tokens). Whatever you decide, chances are your opponents will have a different plan of attack. The gameplay is fast and smooth, and while there may be a lot of stuff going on, the turns and rounds are pretty straightforward. If you want a meatier game in your life that’s not too terribly difficult, this is the game (droid) you’re looking for. The theme is 110 AD Rome, where optimus princeps, Emperor Trajan, rules in glory. With secured borders (#nopolitics), the people of Rome can once again focus on the nation’s internal matters (this description is basically what it says in the rule book). The mechanics work really well for the theme of being the best Trajan you can be. With so much going on, the rondel system works well in simulating the demands of a political leader. Let things back up too much, and you’ve got yourself an internal crisis. 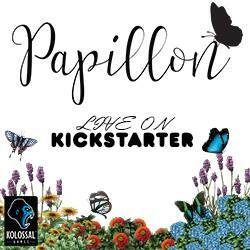 It feels right for the game, and all the actions associated with the rondel feel right at home, as well. The art is good; no complaints here. The board is a nice little map of Italy that turns into other regions (i.e. Germania) the further north it goes, which, I must admit, I like the look of. It certainly helps set the theme and locale of the game. The components are good, as well; from the cards and cardboard tokens to the board, wooden markers, and meeples, everything feels as it should. I love how fast the gameplay feels. I enjoy the many routes to victory. The rondel mechanic for action selection fits well with the theme. Being able to repeat actions rewards planning out your turns. Setup can be a pain in the patootie. Players prone to analysis paralysis (AP) can make for some long wait times. Trajan is big and meaty. Its complexity level ranks rather high (3.68/5 on Board Game Geek), and the amount of options players have makes it so there are many routes to victory. 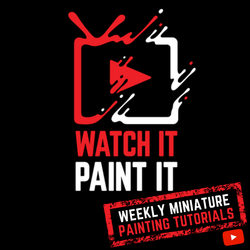 While the setup process can be a bit intimidating, it’s not unwieldy, and if you divvy out the components to your game group, everyone can help set up, making it take not so long. Still, the gameplay itself is worth the individual setup time alone. Stefan Feld knows what he’s doing with his game designs. The game feels appropriately balanced, and while the artwork may not be stunning, the theme hits home and really does make for an engaging gaming experience. The varying player count translates well, too, due to the balanced time tracks on the main board, with a shorter time track for a two-player game, and a longer one each for three- and four-player games. In the end, I’m a big fan of Trajan. It’s been around for a while, and with Renegade Game Studios giving it new life (i.e. a new box), I can see this already-popular game making a huge jump up the charts. Trajan is a fantastic game, and I want to be invited the next time you play. OK? OK. 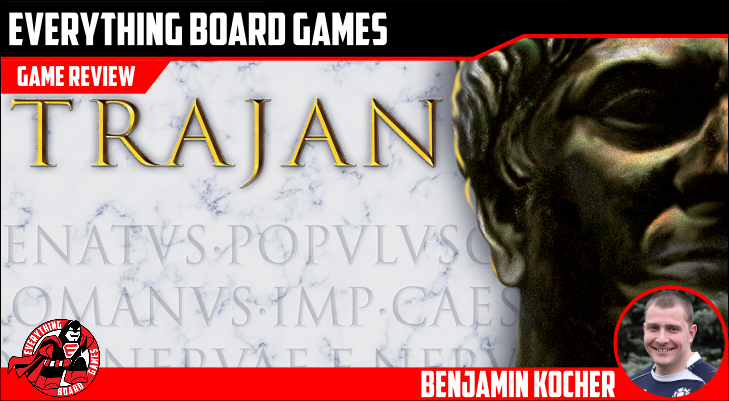 If you’re a fan of any of Stefan Feld’s games, you owe it to yourself to give Trajan a go. Fans of Euro games, games with lots of ways to acquire points (point salad! ), and history buffs that fancy the Roman Empire in and around 110 AD would most likely be overjoyed with this game. Or, if you’re looking for something a bit deeper that’s still fairly easy to pick up (and I don’t mean the physical act of lifting), Trajan is waiting for you. Very interested in this game! Can't wait to finally give this one a try. I love the first edition, and look forward to seeing the new version. Great game!! 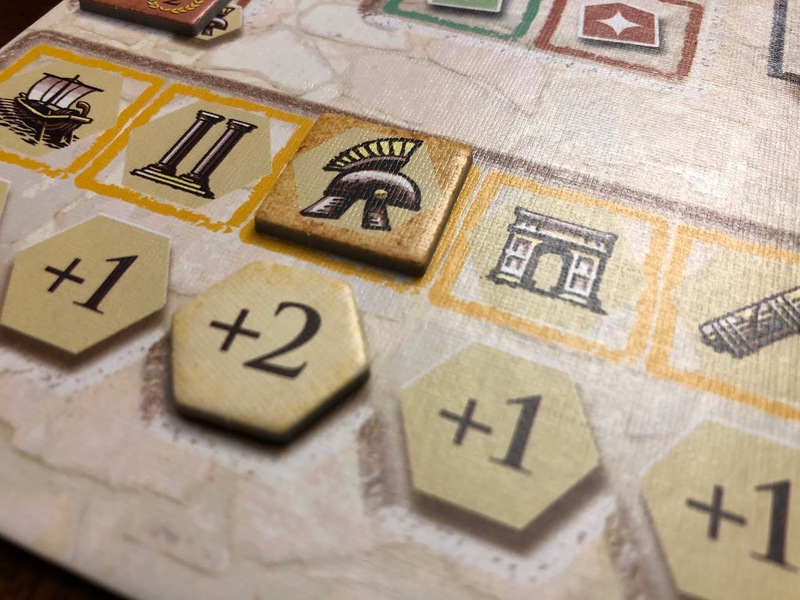 Without having played Forum Trajanum or Carpe Diem and bearing that in mind, I will say that Trajan is the best Feld game that I have played to date. So excited for this! Heard Crusaders was influenced by this. I really need to try this game! Thanks for the review! Game looks awesome...hope I win! I've been meaning to play this for a while. A new edition may present a good opportunity. I've listened to so many podcasts reviewing or talking about this game but this is seriously my first time seeing it. I can't wait to play. I know a lot of people who are really luke warm on this game, but it keeps resurfacing in my ephemera. I should really just try it once. I’ve wanted to try this for a while now, can’t wait for the new edition! The mancala system is fascinating. This is such a fun game! I have played it a bunch of times, and will be happy to play many more! Looks like an amazing entry into Ancient Rome genre. One of my top 5 games of all time. Glad to see this will be getting a new edition. This is one of Feld's best games! Thanks for the contest! Thank you for the review. Always on the lookout for great games. Nice review. Thank you for the giveaway!